For a format marketed as “Eternal,” each year in the History of Vintage delivers unexpected twists and turns in the direction of the metagame and the evolution of the card pool. Nonetheless, certain fundamental axioms are observed over time. Occasionally, these perdurable verities are controverted, as when manaless Dredge proved a deck could not only win without playing spells, but was optimized without Moxen. 2012 taught that even the most unshakable truths and foundational assumptions are open to question, if not doubt. In the final analysis, 2012 was a liminal moment in the history of the format. Although it was not quite the final gasp of big blue decks featuring Tinker, Yawgmoth’s Will, and Time Vault, it was the final title in a dynasty of powerful Weissman School decks. Out of this interregnum would arrive a Vintage format far more homogeneous, slower, and less defined by restricted cards. So, here's the skinny: I'm in striking distance of completing this project. Although this is just Chapter 20, the next two chapters have already been edited, and are nearly done. And two more chapters have already been written. So, this thing will be done before you know it. find stories, articles or other anecdotes that I've missed. Are there cool graphics or photos (without copyright infringement) that we can include? Is there a great article out there that should be mentioned or cited? Are there tournaments that I didn't include, but should have, either in the main narrative or in an endnote? Is there a big event somewhere in the world that I missed but should mention? Was there a development somewhere that I missed? Are there any mistakes, errors or mistatements of fact that anyone can spot? And I'm not just talking about this chapter, I'm talking about the whole series so far. As a teaser and a reward, here's my initial draft of the first page and half of the book's conclusion, which will come after the last chapter (Chapter 25: 2017). For most of its existence, the Vintage Format has existed at the margins of Magic: The Gathering game play. It is played neither on the Professional Magic Tour nor featured in Grand Prix events. It’s far down the list of most frequently played formats. Yet, it is the only Magic format, that in any meaningful sense, can trace itself back to the origins of the game. This is not merely a lineal relationship, as between ancestors and descendants. The Vintage format is properly recognized as a format that has existed since the beginning of the game. Following this logic, we might designate January 26, 1994 as the birthday of the format that is now known as “Vintage,” for this was the day that Beth Moursund, Wizards of the Coast’s official NetRep, announced the Duelist Convocation’s first mandatory deck construction rules, Banned and Restricted Lists (initially designated as a “Limited List”), and issued tournament “floor rules.” This designation may be well-founded, especially given the institutional continuity from that announcement with subsequent amendments and modifications to the Banned and Restricted List. But there is an alternative to this designation. Viewed through the lens of strategy, the era of “Wild Magic” described in Chapter 1 that preceded the institution of mandatory Duelist Convocation rules evolved strategies and deck design concepts, in their most distilled and streamlined forms, that would later become the fundaments of some of the great Schools of Vintage Magic. And although the Duelist Convocation may have only instituted mandatory rules as of late January, 1994, that does not mean that there were none. As noted, there were widly used recommended rules, and before that the deck construction rules of the Alpha rulebook. We should not confuse broadly permissible deck construction parameters for an absence of rules. 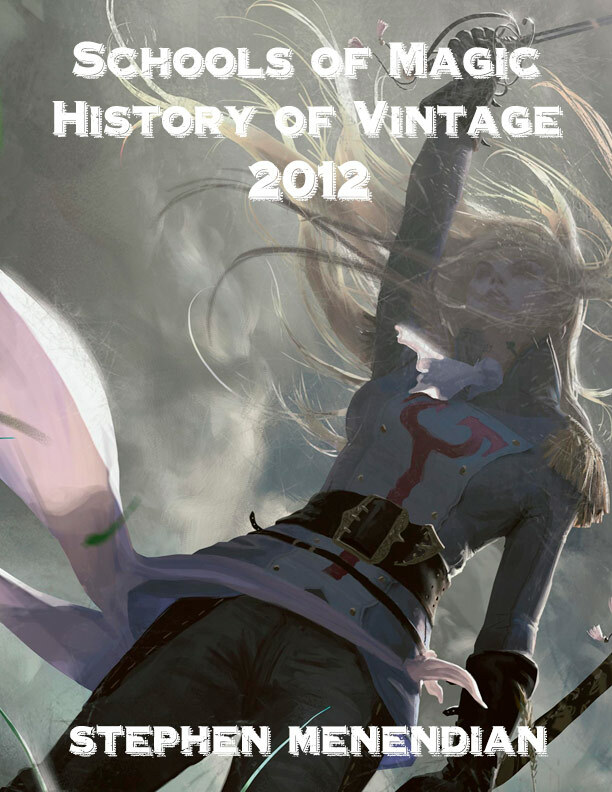 As a format that has evolved with the game itself, there is much to be learned from the history of the Vintage format. This book has sought to reveal or convey those insights through a narrative of that history. This history is not simply a telling of what happened, of what decks won tournaments, and the evolution of a metagame through new set releases and rules changes. It is a multi-layered story of human ingenuity and creativity, competition and community, technology and social networks. It is a story of how the vision of one man, Richard Garfield, could not be confined to the boundaries of his imagination, and how the game he designed to rotate over time could nonetheless exist in a continuous form through careful maintenance and management under the scrutiny of a fractious player base. It is an intellectual history of players mining the resources available to them to find successful niches, to solve metagame obstacles and overcome competition with creative genius. There are tales of achievement, triumph, and heartbreak. It is a story of a game that arose at the birth of a new tech economy, and how that economy powered the game and brought players together. Like Amazon, companies such as Starcitygames built corporate empires through online retail by providing strategy content, at first, to niche formats like Type I/Vintage. But it is also a story of how people came together and built communities of shared interest on message boards and social media and revived a moribund format through their collective passion; and how the evolution of the internet and technology, including live streaming and podcasting channeled and sustained these connections. This book owes a debt to Robert Hahn’s martial arts analogy of “Schools of Magic,” and barrows from that conceit liberally. The motivating framework of the book is that six great “Schools of Vintage Magic” define a greater part of the strategic landscape of the Vintage format from it’s inception through the present moment. Hahn defined a "school" not as a particular deck or theme, but as “a set of coherent principles about the game which guides every phase of play, from deck construction, to general play, to situational play,” and so on. Adopting Hahn’s definition, I’ve argued in these pages that these six Schools of Vintage Magic emerged in the first five years of the game, and have largely persisted since, jockeying for position and continuously improving themselves with new technology and printings. Only one of the four schools of in Hahn’s original classification scheme and two of the six in his revised scheme, with the benefit of hindsight, appear to constitute “schools” in the sense Hahn intended. With the advent of Type II, Hahn struggled to maintain the conceptual focus, and his organizing framework began to fray. Hahn tried to maintain his thesis and School definition across formats, largely without success. Necropotence, in particular, presented challenges to his framework while being an object of intense interest for him. Despite the mistakes in his classification scheme, the overarching framework has proven remarkably prescient and durable, as we’ve seen throughout this book. Impressing the insights deriving from the martial arts schools, Hahn noted how the “Schools” metaphor encompassed player development: “In exploring the concepts embodied in these various schools, I think it is possible for the beginner to gain practical deck designs, for the intermediate player to further refine his own strategy, and for the advanced player to gain further insight into the game which may ultimately allow him to create his own school.” While perhaps inaccurate in some particulars, Hahn tapped into a vein deep insight and wisdom, beyond what he could have understood at the time. And the conclusion goes on for a few more pages like this, and then closes with a comprehensive look at each of these schools of Vintage Magic. Man I tore up that year with Rug Delver. I miss that. And modest, too, I see.